The BBC reported earlier today that Uber did not tell anyone about the breach that affected 57 million customers and drivers. David Kennerly, director of threat research at security company Webroot, criticized Uber for paying a ransom to the hackers. "Given the current climate around data security and breaches, it is astonishing that Uber paid off the hackers and kept this breach under wraps for a year. The fact is there is absolutely no guarantee the hackers didn't create multiple copies of the stolen data for future extortion or to sell on further down the line." What's worse than being hacked? Covering up a hack. "Some of the new offerings involved acquisitions. Others are homegrown. But they’re all coming together. Indeed, Webroot is coordinating its R&D, sales and marketing efforts to make it easier MSPs to try, buy and deploy the security solutions, Potts says." New Webroot CEO Doubles Down on MSPs, Managed Security Services - ChannelE2EWebroot CEO Mike Potts & VP Charlie Tomeo maintain a laser-like security focus on MSPs in the SMB sector -- as AlienVault & others give chase at IT Nation. By combining a range of threat technologies, deployed over numerous stages, cybercriminals maximize the likelihood of infection success. Here are 5 tips to help MSPs achieve a multi-layered cybersecurity strategy. Why MSPs Need a Multi-Layered Approach to CybersecurityCybercriminals use multiple methods and threat vectors to attack your clients. Here are five tips to help MSPs secure their clients with a multi-layered cybersecurity strategy. We’re revealing the top 10 nastiest ransomware attacks from the past year. NotPetya came in on our list as the most destructive ransomware attack of 2017, followed closely by WannaCry and Locky in the number two and three spots, respectively. NotPetya took number one because of its intent to damage a country’s infrastructure. Unlike most ransomware attacks, NotPetya’s code wasn’t designed to extort money from its victims, but to destroy everything in its path. Webroot customers are protected from the Bad Rabbit malware that is affecting computers across Russia, Ukraine, Bulgaria, a few surrounding Eastern-European countries, as well as Japan. Bad Rabbit is a well-made piece of malware that uses a lot of clever tricks to spread, similar to NotPetya, which affected customers across the globe this summer. Bad Rabbit has been successful as it has worm-like behavior, using embedded usernames and passwords to move laterally through the network. Attackers used compromised websites, most of which are news sources local to the APAC/Eastern European region, as watering-hole infection vectors which helps explain the geographic location. More about Bad Rabbit, what you can do to protect yourself even further, and what one of our Senior Advanced Threat Research Analyst had to say about it here. Over the last few months, officials have been piecing together the case against Rigzone founder, David Kent. After selling the Rigzone domain several years ago, Kent used several backdoors he’d implemented to access account information for over 700,000 customers, which he then attempted to sell back to Rigzone. By setting up several dummy accounts, Rigzone staff determined the specific IP address Kent used and apprehend him. In the last year, banks in several Eastern European countries have seen a drastic rise in fraudulent charges at ATMs that have allowed hackers to make off with nearly $40 million dollars. Attackers start by manipulating the banks overdraft protection and setting up proxies to allow accomplices in other countries withdraw massive quantities of money from separate accounts. In addition to spoofing the overdraft system, the attackers also installed remote access software on bank computers to enable further intrusion to the institution’s systems. More on our blog here. In a recent statement, Yahoo announced that its 2013 breach, which took nearly 4 years to investigate, has impacted all 3 billion of their site’s unique users. Along with this recent update, the company is still reeling from a separate 2014 breach, which holds the dubious title of 2nd largest data breach to date. This update to the total affected users isn’t surprising, given that the original breach left questions as to why some accounts were compromised, while others remained untouched and showed no signs of malicious activity. Recently, Facebook founder Mark Zuckerberg issued an apology for the site’s lack of action in stopping Russian advertisements and fake news articles, which have been circulating heavily since the 2016 election season. His statement goes on to promise that additional safeguards will be implemented to ensure Facebook can continue to be a safe platform for users to voice their opinions. More stories you might have missed this week on the Webroot Blog! Cyber News Rundown: Edition 10/06/17The Cyber News Rundown, by Connor Madsen, Webroot threat research analyst. brings you the latest happenings in cyber news weekly. Another day, another phishing attack. From businesses to consumers, phishing attacks are becoming a more widespread and dangerous online threat every year. One wrong click could quickly turn into a nightmare if you aren’t aware of the current techniques cyber scammers are using to get access to your valuable personal information. Stay safe with these tips. Phishing: don't take the baitPhishing is one of the most popular tricks criminals use. 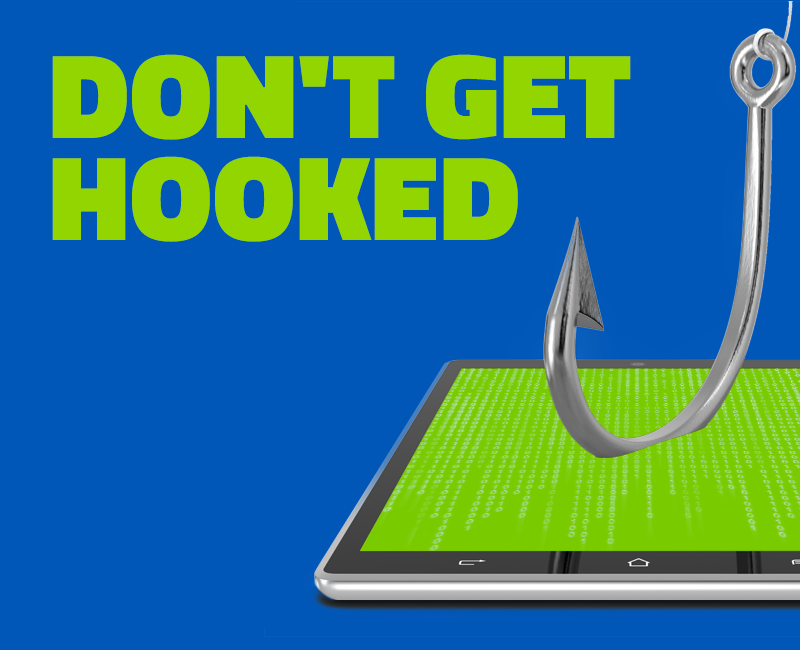 Read on to learn what is phishing and how you can avoid becoming a victim. Following the discovery last week that ThePirateBay has been using a Monero miner to experiment with revenue alternatives for the site, researchers have found that both Showtime.com and ShowtimeAnytime.com have embedded code for similar cryptocurrency mining. The code itself runs only while the user is on the site, and ceases once they navigate away. The main concern, however, was the high CPU usage users experienced. The script in question was removed after several days of testing, but Showtime has yet to comment on their implementation of the crypto-miner or its intended outcome. In the past few days, researchers have found a trove of credit card data that could be tied to a recent breach at Sonic, the popular drive-in restaurant. The data is organized by the location of each card, and currently contains nearly 5 million unique card numbers and related info. While Sonic has not yet determined the cause of the breach, they have been working with their credit processing company to identify the compromised store locations and implement credit monitoring for affected customers. More cybersecurity news you might have missed from the week on our blog. 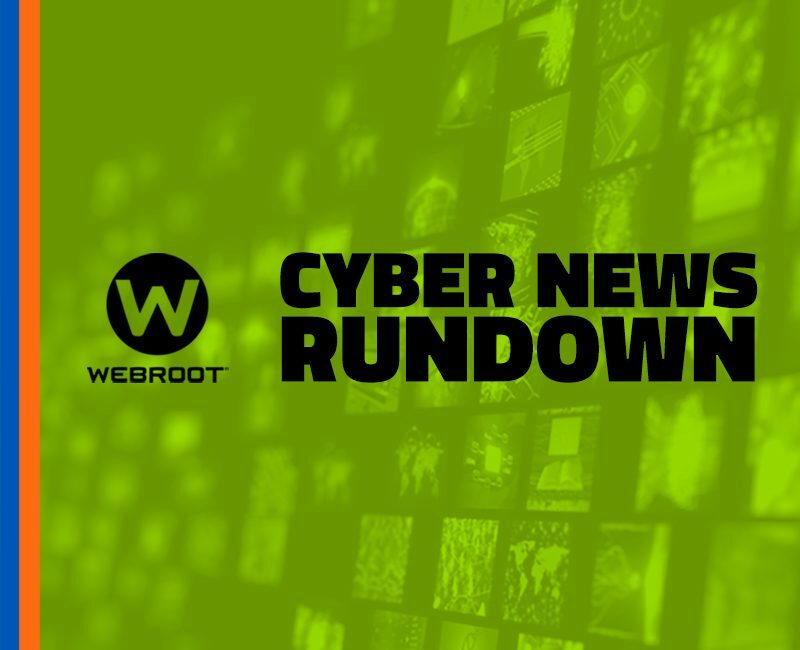 Cyber News Rundown: Edition 9/29/17The Cyber News Rundown, by Connor Madsen, Webroot threat research analyst. brings you the latest happenings in cyber news weekly. 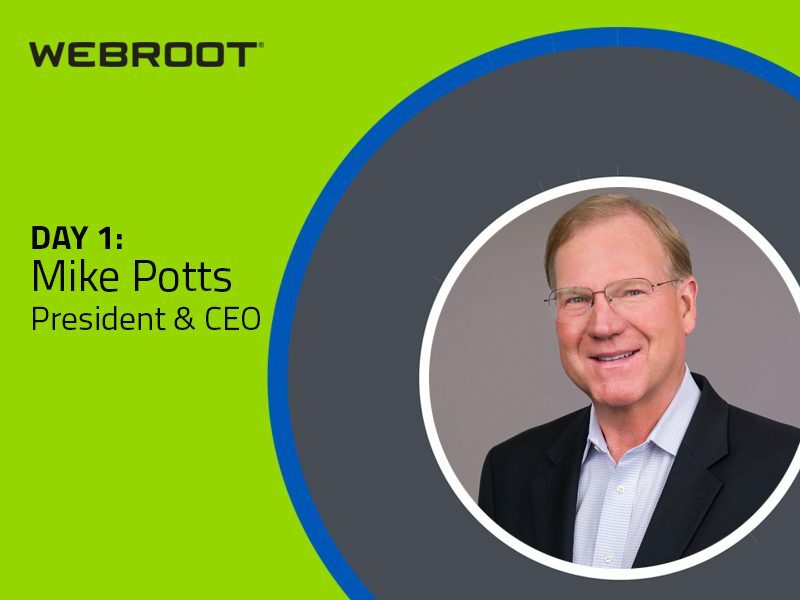 Mike Potts, Webroot's new President and CEO, shares his thoughts on why he joined Webroot and where he sees the cybersecurity industry going. I’m delighted to join the Webroot team officially today as CEO. We helped define the cybersecurity field in our first 20 years, but I believe our best days are ahead. 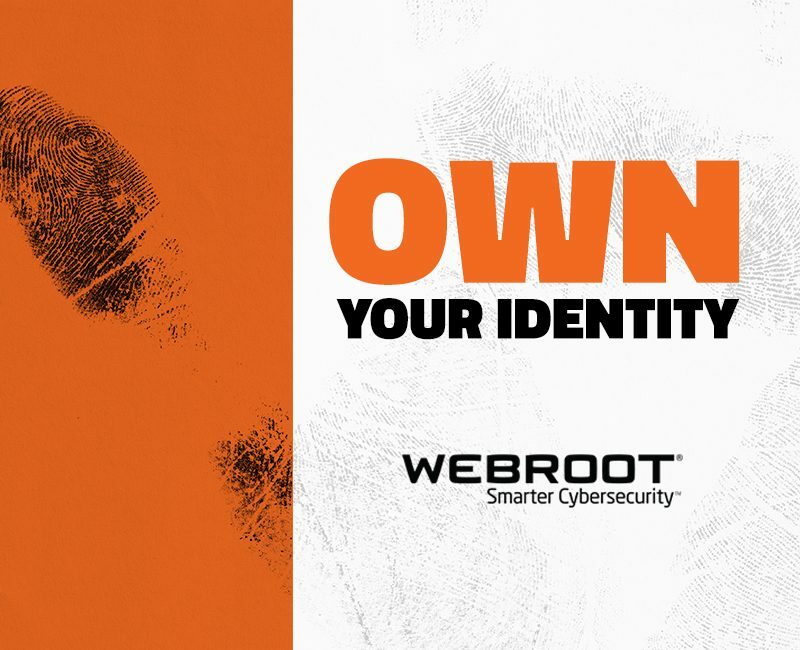 With this introductory post, I thought I’d let you know where I intend to focus in my first months at Webroot, with the goal of taking our customers, partners, and company to the next level of success. More from Mike on our blog about his plans for the future of Webroot. With global ransomware attacks, such as WannaCry and not-Petya, making big headlines this year, it seems the unwelcomed scourge of ransomware isn’t going away any time soon. While large-scale attacks like these are most known for their ability to devastate companies and even whole countries, the often under-reported victim is the average home user. We sat down with Tyler Moffit, senior threat research analyst at Webroot, to talk ransomware in plain terms to help you better understand how to stop modern cybercriminals from hijacking your most valuable data. DNS is one of the basic services on which the web is based and it has proven to be robust and scalable to an astounding degree. Unfortunately, it's also vulnerable to hacking and can be a serious attack vector if left unprotected. Dave Dufour, director of cybersecurity and engineering at Webroot, is an expert on DNS and its implications in network security. Security Now talked with Dufour about the issues with DNS and what organizations should be doing to protect their networks, employees and customers from DNS-based threats. Read more of the interview on Security Now. With German elections only a couple weeks away, researchers have been working to determine how secure the voting systems really are. Per a recent study, the software being used contains multiple vulnerabilities that could lead to devastating results if the election is compromised. Meanwhile, the software creator maintains there is nothing wrong with the system and any tampering would only lead to confusion, rather than truly affecting the vote’s outcome. While overlay attacks are nothing new to Android™ users, the Toast window is a surprisingly fresh take on this technique. Google has already patched the issue being exploited, but many users unintentionally fell victim and gave permissions to a malicious app using the Toast window overlay on a legitimate page to spoof the users input. This type of attack can range from simply installing an annoying piece of malware on the device, all the way up to locking the device down and demanding a ransom. Over the past week, researchers have discovered a new ransomware variant that attempts to impersonate both the IRS and the FBI, similar to the FBI lockscreen malware that was popular several years ago. By tricking the victim into opening a link to a fake FBI questionnaire, the ransomware is downloaded onto the machine and begins encrypting. Fortunately, both the FBI and the IRS are taking great measures to alert possible victims and to catalog any scam emails that are being sent out. Back in May, the UK’s National Health Services fell victim to a large WannaCry ransomware attack. While most of the districts have since regained full functionality, the district of Lanarkshire has once again been targeted. A cyberattack on its staffing and telephone systems left the district with only emergency services for several days. This event just reinforces the importance of updating security on critical systems before an attack, and even more so after one as devastating as WannaCry. To read all of the stories, visit the Webroot Threat Blog. During the past week, a breach was discovered in patient booking system SwiftQueue, which is widely used by several National Health Service (NHS) facilities. The database may have contained patient information for up to 1.2 million UK citizens, though the actual data has yet to be fully examined. Even worse, attackers now claim they have found additional SwiftQueue vulnerabilities and are in possession of all 11 million records stored by the company. 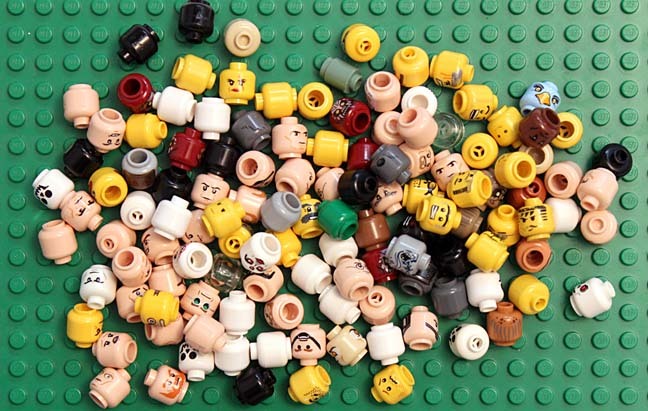 Researchers recently discovered a large customer data dump in a publicly-facing Amazon S3 bucket. The data in question belongs to Groupize, a groups and meetings solution, and contains everything from customer interactions to full credit card information used to book hotels and other meeting spaces. Fortunately for anyone who has used the service, the data was properly secured within a week of the discovery. Your Identity Is Yours. Here’s How To Keep It That Way. Have you ever been out with friends, had a little too much to drink, and left your credit card in a bar? Or maybe you thought you’d stowed your child’s social security card safely away in your desk drawer, but now you can’t find it. It may seem like losing these items is just an inconvenience, but the reality is that simple slip-ups like these can spell disaster for you and your family. We recently took to the streets of Denver to get a feel for how average Americans are staying safe from identity theft. Their responses were not so surprising. The credit piece is a big one that I think many don't pay enough attention to. It's important to know where you stand and stay up to date with your credit score and in some cases, freeze when needed. That project sounds really interesting! Fun that you got to work on that Brian! New variants of Locky—Diablo and Lukitus—have surfaced from the ransomware family presumed by many to be dead. After rising to infamy as one of the first major forms of ransomware to achieve global success, Locky’s presence eventually faded. However, it appears this notorious attack is back with distribution through the Necurs botnet, one of the largest botnets in use today. For the initial list of MD5s and more detail on Locky. Webroot has acquired the assets of Securecast, a security awareness training platform. Building on Securecast, Webroot Security Awareness Training will give managed service providers (MSPs) and businesses a solution to reduce the risks and costs of phishing, ransomware, and other cyber threats with end-user education. Webroot Security Awareness Training is available today as a beta program, with general availability scheduled for later this fall. The beta will allow participants to operate phishing simulations and provide a test course to address the weakest link in an organization’s security posture: the human factor. By combining the latest threat intelligence, technology, and training, Webroot enables businesses to reduce their security risks by continually educating their users and testing their awareness on cybersecurity best practices. Webroot Security Awareness Training is a fully hosted Awareness-as-a-Service platform with an end user training program and a sophisticated phishing simulator. Ransomware, one of today's biggest security threats, has become a massive growth opportunity for our channel. As key stakeholders fear now that their organisation will eventually be hit by a ransomware attack, they are willing to spend more on IT security solutions. Why is NHS spending 50 million pounds to improve its cyber security? Why are schools and top universities the perfect targets for the file-encrypting attacks? How much are businesses willing to invest after their first ransomware attack? How to remain competitive and win the cyber security market? Register Now and Secure your Spot! This past May, Webroot surveyed more than 600 IT decision-makers at medium-sized companies (with between 100 and 499 employees) in the U.S., U.K., and Australia. The survey focused on how these small businesses perceived new threats facing their organizations. Some of the answers were surprising. 96% of those surveyed believe they are susceptible to cyber threats. 80% use third-party IT security resources (mixed-use IT and security teams). 94% are updating their security budgets to account for mitigating new threats. 71% still admit not being ready to address cybersecurity threats. Get the full report and more stats here. AI is finding its way into every day business and government. The idea of AI is not a new, but what is different is that today's hardware and software is bringing the various concepts underpinning AI to a mass market. What’s new, too, is the driver: from bots and digital assistants to autonomous vehicles Google, Microsoft, Facebook, Nvidia and others in Silicon Valley are setting a drum beat to which the rest of are marching. A recent incent industry report states that artificial intelligence and machine learning have great potential, but can’t yet match the breadth of human intelligence. While I would argue you can’t have one without the other, meaning humans are an integral part of both AI and machine learning, both of these technologies have the power to be better than any single employee. Our CTO, Hal Lonas, talks Artificial Intelligence and machine learning with Information-Management.